A one day masterclass in evidence-based policing for officers and staff. The Local and Community Policing network are hosting two events on 28th June and 4th July. 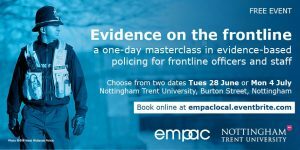 They are an introduction to evidence-based policing for front-line police officers and staff from across the East Midlands. The workshop will introduce the key features of evidence-based policing and how it can help police to provide the best possible service to local communities. You will have the opportunity to ask questions and share ideas with colleagues from other forces along with experts from local universities. You will also learn how to get started using an evidence-based approach in your own area and what support is available to you. A hot lunch and drinks will be provided. Tickets are free and available on a first-come, first-served basis so book online now.